I love Cuisipro. I will buy pretty much anything from them. I think that their silicone spatulas and spoons are the best (I owned six at the last count). So I picked this up on autopilot while shopping for a bundt tin before Christmas. No, it's not Cuisipro's first foray into the world of birth control; it's a cupcake corer. I took it home and complained on Twitter about how I just paid £5 for something I'd never use. I was going to return it, but @iwbadg convinced me that I'd find it useful if I gave it a chance. Once upon a time, if I wanted to make a hole in a cupcake, I would use a knife to funnel it out. Thus, the hole would usually be somewhat conical and crumb-filled. That was the stone age of cake-hollowing. I have to say that the corer didn't always funnel everything out from the centre on the first try and I had to have a second go at some of the cupcakes, to extract bits that had been left behind on the first attempt. But really, the only way this tool could be more satisying to use, is if the plunger made the 'ker-dunk' noise your car's central locking makes, when you pushed the excess cupcake out of the corer. If you bake and have slight OCD (the two seem to go hand in hand), you should buy this. The corer seems to be more widely available as part of a cupcake decorating set, retailing for £15. But I picked mine up as a single item for £5 from Whisk. Banana cupcake recipe courtesy of The British Larder, minus the white chocolate chips. A portion of cream cheese frosting (see British Larder recipe, above), with 2 heaped teaspoons of Caramel folded or marbled into it. To assemble: make cupcakes, allow to cool. 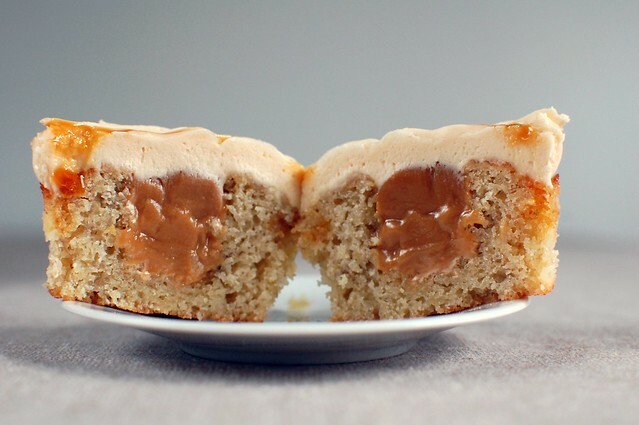 Core each cupcake and fill each hollow with caramel. Apply caramel frosting, liberally. 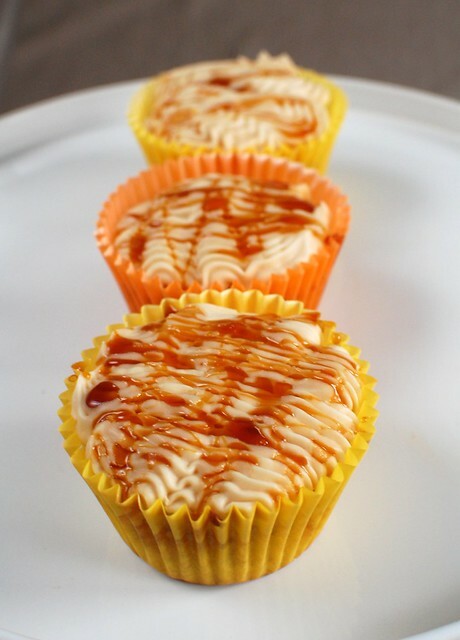 Drizzle caramel onto the top of each cake and allow to cool. 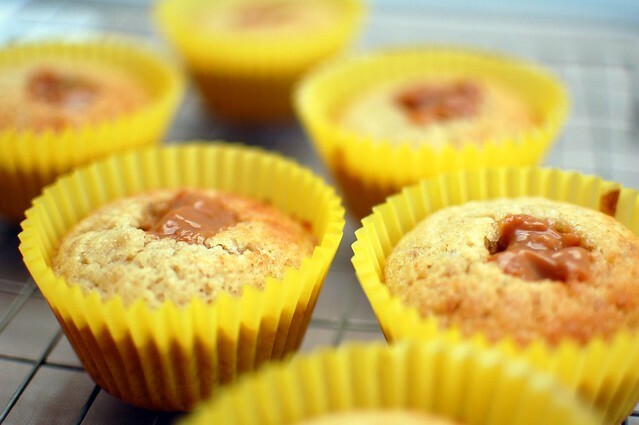 Thanks to the banana, these cakes actually keep for best eating the day after they are made. Keep in a cool place, but do not refrigerate. I've wanted one of those cupcake corers for ages! I think silicone bakeware is great. I have cupcake holders that are fab. The only thing is that if I take cakes to work, I have to take them out the holders first to avoid having to ask for them back! That is quite cool although I do wonder whether a paring knife would do the job just as well?! Lovely looking cupcakes.